Commuting via bicycle can be rough. There are nails and potholes waiting to destroy your tires, cars waiting to smoosh you, and thieves waiting to steal your bike as soon as your back is turned. The last problem is so pernicious it keeps a lot of people from riding, and those that do opt to ride ride $100 junkcycles. That way they don’t lose any sleep when they come out after a night of drinking and find a chain dangling from the stand where their bike used to be. Vanmoof, a popular Dutch bicycle company, thinks it has figured out how to make a bike that can’t be stolen. 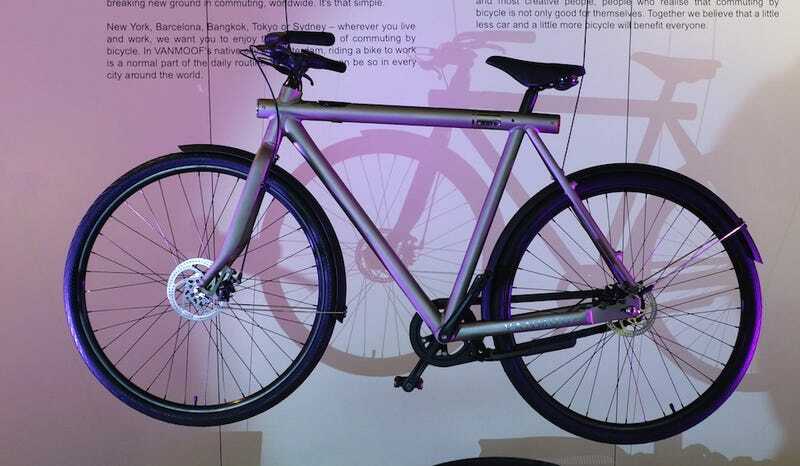 Last night, in its swanky shop in Brooklyn, VanMoof unveiled the SmartBike. The smarts have nothing to do with the rider and everything to do with the bike, which has a computer and GPS built directly into the frame. The computer so you can know how far and fast you’ve ridden, and GPS so you, or Vanmoof, can track your bike if it wanders away. Check out those welds on that double-butted aluminum frame. Double butting means the frame will be lighter without compromising the strength of the frame. Also note that giant hole. That’s where the lock attaches to the frame. Starting at $1,098 for a 3-speed, the SmartBike will be available in two colors (grey and black), two speeds (3-speed or 8-speed), and a whole range of sizes so that everyone from the stubby-legged to the willow-legged will have a whip to roam around town in. It will also include a keyless lock that you can engage with a remote dongle on your phone. And there’s no need to worry about charging your bicycle (which also includes lights built into the front and rear). The hub on the front wheel of the bicycle is a dynamo hub, which stores energy from your cycling to charge any and all the products wedged into the frame. Yet the real star of the show is the GPS. Vanmoof is so certain that their bicycle can be tracked down, anywhere, in the world that they will provide you with a new bike if yours can’t be recovered by their team. “The risk should be on the brand, not the owner,” Taco Carlier, one of VanMoof’s two founders, told the gathered mix of friends, press, and cycling enthusiasts. The round of applause that went through the small shop suggests that he might be onto something with that idea. We’ll have more details, including how well the SmartBike’s GPS actually works, when we review it later next month. The VanMoof SmartBike is available for pre-order now and should ship early in June.